The OTT® Acoustic Digital Current meter (ADC) delivers consistently accurate results with the most advanced acoustic technology available for point velocity measurement. 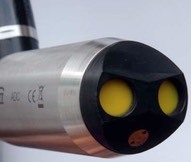 Designed specifically for in-stream velocity measurement, the ADC features a sensor with two 6 MHz acoustic transducers, temperature and depth sensors, and a cable and handheld unit for signal processing. Click here for OTT ADC software downloads!